It is conceivable that Mubarak may be unable to stand the pressure of long-contained popular demands. Like the other countries in the region, Egypt is a "bipolar society" where most of the economic resources are owned by the few. Many Egyptians, like the Tunisians, may also be singing the words of the Tunisian poet Abu Al-Qassem Al-Shabi: "When people decide to live, destiny shall obey." Outwardly, President Mubarak’s regime is behaving with confidence. Internally, though, there are probably many scenarios being gamed out about a possible repetition of the Tunisian popular revolt. And it is conceivable that Mubarak may be unable to stand the pressure of long-contained popular demands. One of the most contentious issues is the Emergency Law, which last May was extended for two more years after being in effect since President Anwar el-Sadat was assassinated in 1981. The government has broken promises to revoke this law several times. The Emergency Law allows the government to arrest people without charge, detain prisoners indefinitely, limit freedom of expression and assembly, and maintain a special security court. The Emergency Law enables the Egyptian authorities to refer civilians to emergency and military courts, which don’t meet basic standards of fairness. Although the government has never confirmed the number of those detained under the law, human rights organizations in the country estimate that between 5,000-10,000 people are still detained without charge. “The regime only respects human rights when they do not threaten the stability of the existing system,” stated Bahey el-din Hassan, director of the Cairo Institute for Human Rights Studies. Egypt’s entrenched dictatorship has been confidently trying to discredit the idea of domino-effect democratization. In an unambiguous show of political force, extra battalions of riot police have been stationed next to the Tunisian Embassy in Cairo, where some protests against the regime took place. Protesters, however, were outnumbered five-to-one by riot police. Egypt’s liberal activists are waiting for the right moment to conduct demonstrations against the government. Several liberal factions are planning to stage a major protest on January 25, to coincide with the national holiday honoring the country’s police force. Frequently, both police and security forces engage in torture and brutality of those detained in police stations and detention centers. In the meantime, despite an estimated growth rate of near 6%, many Egyptians state that economic growth hasn’t benefited ordinary citizens. 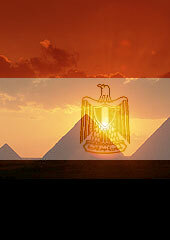 The number of Egyptians living below the poverty line in 2008 and 2009 amounted to 16.3 million. Like the other countries in the region, Egypt is a “bipolar society” where most of the economic resources are owned by the few — and the basic needs and wishes of most of the population continue to be unfulfilled. To add to the atmosphere of potential unrest, Egyptian stocks and the Egyptian pound have fallen, as investors fear that the situation in Tunisia could also affect Egypt. That possibility has been strongly denied by high government officials. “The talk about the spread of what happened in Tunisia to other countries is nonsense. Each society has its own circumstances…If the Tunisian people decide to take that approach, that is their business,” Egyptian Foreign Minister Ahmed Aboul Gheit told reporters in Sharm El-Sheikh during the second Arab Economic Summit.